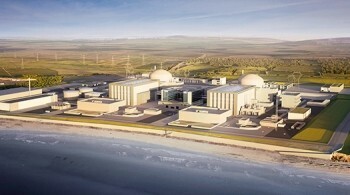 Britain asked for Ireland’s views on the environmental impacts of Hinkley Point C, a nuclear power plant which is already being built in Somerset, England. More information on this consultation, and how to participate in the “Transboundary environmental public consultation – Hinkley Point C“, is available at an Irish Government web page here and at our web page here. While the potential negative environmental impacts of a project can receive most attention, potential positive environmental impacts must also be considered in order to fully assess the project’s overall environmental impact. The transboundary environmental impacts on Ireland of Hinkley Point C Nuclear Power Plant (HPC) can therefore be assessed by considering the potential for environmental impact both from routine operations and from an accident or other unplanned event at the plant. All official studies have found that there will be no significant negative environmental impact from routine operations at HPC. No official study anticipates that there would be a positive environmental impact from abnormal operations at HPC. The predictable positive impacts arising from routine operations at HPC need to be balanced against the potential negative impacts of abnormal operations. These are the impacts that have received most attention and most study. Because British studies predicted that the environmental impact of HPC would not extend beyond the West coast of Britain, their studies did not include the transboundary environmental impacts on Ireland. However, there are two Irish studies that are appropriate in this regard, and it from these studies that our conclusions are drawn in this regard. A study conducted by the Radiological Protection Institute of Ireland (RPII) found that, while there would be no environmental impact on Ireland from routine operations at HPC, there is potential for a small but measurable radiological impact on Ireland under certain accident conditions. The study found that, in the unlikely event of a serious accident at HPC when the weather was unusually unfavourable, there could be a small but detectable increase in radioactivity in Ireland. While the radioactivity would be insignificant in radiological terms and there would be no measurable health impacts in Ireland from any resultant radiation, there would be an economic cost associated with even this small increase in radioactivity above background levels. The timely introduction of appropriate agricultural management actions and food controls, as envisaged in the National Emergency Plan for Nuclear Accidents, would substantially reduce most of the insignificant radiation dose from ingestion of contaminated food produce. So, there could be an insignificant but measurable increase in radioactivity in Ireland from an unlikely major accident at HPC during unusual weather patterns. As there would be no measurable health impacts resulting from this small increase in radiation, there is no technical reason why this impact should be require any remediation in Ireland. There would, however, be considerable pressure to respond for political, social and reputational reasons, and there would be a significant cost associated with this response. These costs do not appear to be related to ‘environmental impact’, but this would need to be clarified. Ireland’s Economic and Social Research Institute (ESRI) estimated the costs of potential large releases of radioactivity from a nuclear reactor in Western Europe as being considerable. It is not clear that these costs are relevant to the current consultation, which is concerned with the environmental impacts of such releases, as they appear to relate to actions required for political, social and reputational reason rather than for environmental remediation. If some of the actions considered by ESRI do indeed relate to environmental impacts, then the associated and potentially substantial costs would need to be considered as part of this consultation. The primary environmental benefit from the routine operation of HPC is the predictable avoidance of emissions attributable to HPC compared to the most likely alternative plant, which could amount to 10.3 million tons of CO2 per year. While the associated improvement in air quality will benefit the residents of Somerset and neighbouring counties, no study was found that addresses their direct environmental impact on Ireland, although the impact is likely to be small. Our overview of the environmental impact of HPC on Ireland is summarised in Table 2. The Routine Positive impacts are predictable and small but may not have been quantified to date. The Abnormal Negative impacts are radiologically insignificant: the published costs appear to be related more to political, social and reputational rather than environmental impacts – this needs to be verified. No measurable health impacts on Ireland from resultant insignificant but measurable radiation. Potential for considerable expenditure in responding to the incident for political, social and reputational reasons – but not expected for environmental reasons. In summary, the transboundary environmental impacts on Ireland of HPC would appear to be neutral. Further consideration is required of the costs associated with addressing any environmental impacts of a serious incident at HPC. On balance, it would appear that Ireland should welcome the development of HPC as a step towards reducing carbon emissions globally.